In stock -This product will ship today if ordered within the next 2 hours and 23 minutes. Dr Bronner`s 18-in-1 Organic Citrus Orange Castile Liquid Soap stimulates the skin and invigorates the body, resulting in a truly refreshing shower experience. 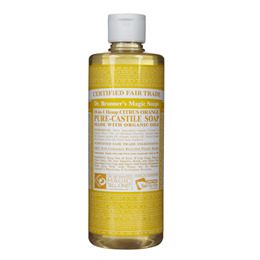 Dr Bronner`s is an independently owned, family business that dates back 150 years. 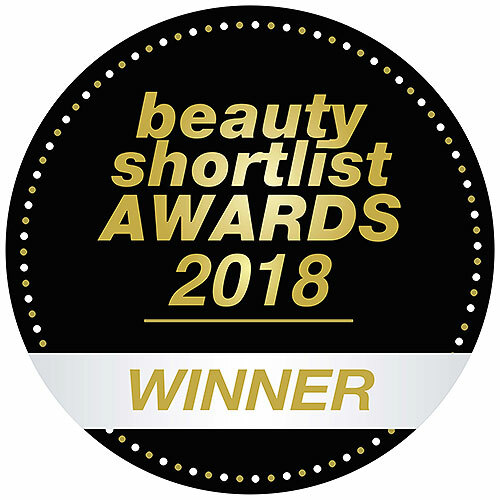 Dedicated to making natural organic products for the greater good of mankind, these products are also known for their quality and multiple uses that are sure to make your life easier. 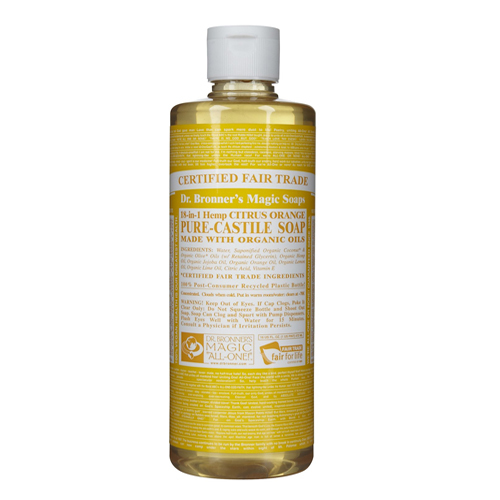 Dr Bronner`s soaps are 100% true pure-castile soaps that use certified organic ingredients under the fair trade act without animal testing. They have created or partnered with various fair trade organic projects all over the world, the Dr Bronner`s fair trade and eco-friendliness beliefs ensure fair prices, living wages and community benefits for farmers, workers and their families. Water, Organic Coconut Oil*, Potassium Hydroxide**, Organic Orange Oil, Organic Olive Oil*, Organic Hemp Oil, Organic Jojoba Oil, Organic Lemon Oil, Organic Lime Oil, Citric Acid, Tocopherol. Dilute and enjoy 1 soap for 18 different uses! Hair: ½ Tbsp. in your hand, worked into wet hair, or dilute ½ Tbsp. in ½ a cup of water and work that into wet hair. Shaving: Face - 10 drops; Underarms - 3 drops; Legs - ½ tsp; Work into a lather in wet hands and then apply to area. Foot Bath: 1 ½ tsp. in a small tub of hot water. Laundry: 1/3-1/2 c. of soap for a large load in a normal washer. Add ½ c. vinegar to the rinse cycle. Use half of these amounts for HE. Mopping: ½ c. of soap in 3 gallons of hot water. Ant spray (not on plants): ¼ c. tea tree soap in a quart of water. (This concentration will burn plants). Below are reviews of Dr Bronner`s 18-in-1 Organic Citrus Orange Castile Liquid Soap 237ml by bodykind customers. If you have tried this product we'd love to hear what you think so please leave a review. Best soap ever. Multipurpose. Use on face, body, hair, cleaning around the house. Cuts through grease so easily. I would definitely buy more.